NATO outpost in the Caucasus? Georgia’s pro-Western course is in many respects a left-over from the 1990s, when alignment with the West and membership in its institutions was actively promoted as a cure-all for every problem ailing the country. Georgia’s leaders continue to place their hopes in their country’s eventual admission into NATO, and are doing a great deal to convince the rest of the alliance of the need to admit their country. These efforts include hosting NATO exercises and sending troops to virtually every NATO mission worldwide, most notably the 850 Georgian troops currently in Afghanistan, a continent larger than most actual NATO members are maintaining. Their activities appear to be limited to manning security checkpoints, a task that would otherwise be outsourced to private contractors or even local Afghan forces, and which requires 100% US logistical support in any event, given that Georgia has minimal force-projection capabilities. From the US perspective, Georgia and Azerbaijan still are the focus of its efforts in the region, given that, in combination, they represent an anti-Russian barrier separating it from the Middle East. Moreover, they are a bridge between the Caspian Sea basin and the West essential to implementing the US strategy of prying Russia out of European energy markets and replacing Russian exports by US one or exports from US client states in the region. These efforts resemble similar ones being pursued in Europe, where the US is attempting to cobble together a variety of regional institutions uniting Scandinavian countries and the countries of Eastern Europe including the Baltic States, Poland, Ukraine, Romania, Croatia, and others in order to weaken the EU and isolate it geographically and economically from Russia and, by extension, also China to ensure the remaining “rump EU” becomes a US economic vassal in addition to already being a military protectorate. And, as in the case of Eastern Europe where the US is using all available levers of power up to and including threats to sanction European firms participating in North Stream 2 project, energy also plays a role in the US Caucasus strategy. The Trans-Anatolian Pipeline (TANAP) intended to carry natural gas to Europe is one of the key US-supported projects in that area. However, when the TANAP pipeline was inaugurated in the Turkish city of Eskisehir, only the country’s ambassador to Turkey appeared to represent Georgia, a relatively modest showing considering the importance of the project. This relatively low-key treatment of TANAP by Georgia naturally led to speculation that the country’s political elite is if not in crisis, then at least in a state of active debate over its future. That relations with Russia are close to the top of Georgia’s policy priorities is suggested by President Margelashvili’s suggestion to create a contact group for the purpose of establishing a Georgia-Russia dialogue. Russia has made several such suggestions in the past in order to address both bilateral and regional issues. However, Georgia has not reciprocated Moscow’s overtures, preferring instead to focus on solidifying its ties to the West. So what had prompted the recent suggestions of a thaw in relations with Russia? There are several factors are dividing Georgian elites on foreign policy. One of them is, obviously, Ukraine, another member state of the now-defunct Eastern Partnership which was created to draw post-Soviet states away from Russia and toward the West, to the point of integrating them into both NATO and the EU. Ukraine’s post-Maidan catastrophe which wrecked Ukraine’s economy and brought a bizarre coalition of extreme nationalists and cleptocrats into power, all with Western support, damaged the West’s image in Georgia. It does not help that the country’s own pro-Western leaders like Mikhail Saakashvili who incidentally also made quite a name for himself in Ukraine have had at best a middling success at eradicating corruption and promoting economic growth. But the final straw factor is the Trump Administration’s revised approach to foreign policy. Given that the US has a $20+ trillion national debt, growing at a rate of about $1 trillion per year which coincidentally happens to be the approximate annual cost of US national security policy, the Trump Administration desires to “optimize” US foreign policy by eliminating liabilities and promoting assets. In practical terms it means expecting US allies to become a net contributor of funds to the US economy by purchasing US weapons, energy, and other products. Trump’s repeated hectoring of NATO member states to compel them to raise own defense spending—and “Buy American”—combined with opposition to North Stream 2 encapsulates this administration’s priorities nicely. Trump’s efforts have already had the effect of encouraging Western European NATO members to discuss further integration and even the development of a European rapid response force independent of NATO—and therefore of the US. For a poor country like Georgia it means, occasional sweeteners like the Javelin missiles notwithstanding, that it might become a bargaining chip to be discarded in exchange for some yet-unknown arrangement with Russia, but ultimately also to cut US costs associated with maintaining Georgia as an ally. Unlike Ukraine, whose leadership succeeded in burning most bridges to Russia, Georgia has considerably more room to maneuver. The prospect of a thaw in Russia-Georgia relations was quickly followed by street demonstrations, giving rise to speculatio these events might be related. After all, the Maidan followed President Yanukovych’s decision to shelve EU Association in favor of closer Eurasian economic integration. Mikheil Saakashvili, expelled from Ukraine by Poroshenko, still has many friends in Washington and nurtures ambitions to return to power in Tbilisi. 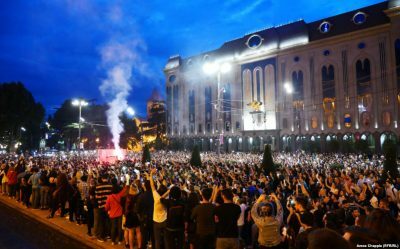 And the onset of the demonstrations in Tbilisi was eerily similar to the onset of the Maidan, namely the killing of a 16-year-old high school student by the police in the aftermath of an after-school knife fight. The father’s demand for his son’s killing to be investigated openly and honestly served as the rallying cry for the opposition parties. The ensuing comparatively peaceful demonstrations and transportation strike had the effect, possibly in combination with behind-the-scenes US pressure, of ousting the otherwise successful Prime Minister Kvirikashvili whose accomplishments included increasing economic growth to 6.5% in part by improving relations with Russia and signing a free trade agreement with China, both no-no’s from the US perspective. The new, “temporary” Georgian government was approved by the parliament on 20 June 2018, with Prime Minister Mamuka Bakhtadze, the former Finance Minister, at the helm. While there are new ministers at Finance, Economic Development, and Foreign Affairs, the key posts of Defense and Internal Affairs are filled by their previous occupants. Defense Minister Levan Izoria, in particular, has been a major promoter of NATO membership, and his retention is a sign Georgia has received the warning and will not attempt independent policy initiatives undermining US goals in the region. Izoria quickly reaffirmed Georgia’s commitment to NATO and is now seeking another token of its support, this time in the form of Stinger man-portable SAMs. Therefore in the end Georgia received a “soft Maidan” in the form of a promise of austerity policies and continued Western integration. Margelashvili, confronted with the prospect of a major domestic conflict, decided not to press the issue and opted against changing Georgia’s course out of fear of sharing his Ukrainian predecessor’s fate. It is yet another demonstration that the post-Soviet republics which have chosen the course toward Western integration have done so at the cost of their own sovereignty. In the longer term, however, it’s unlikely Georgia will be able to sustain its course. Certainly the Bakhtadze government is giving little cause for optimism, given its stated commitment to fiscal austerity which is incompatible with its other stated commitment of reducing rampant unemployment. Bakhtadze himself enjoys little popularity in Georgia and his name is associated with a number of managerial failures, including during his term as the director of Georgia Railroads. Moreover Georgia’s economy will soon have to cope with the effects of quantitative tightening by both the US Federal Reserve and the European Central Bank which will increase Georgia’s costs of international borrowing and sovereign debt servicing. But ultimately the nascent Georgia-Russia “thaw” was nipped in the bud only because Washington was not ready for it yet. The conflicts in the Caucasus, Ukraine, Syria, and elsewhere can only be resolved by Russia and the US at the highest levels. Since these meetings have not taken place yet, and therefore the conflicts continue.